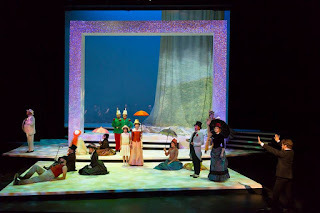 Read what three of our bloggers thought about the first musical by one of the greatest (if not the greatest) American musical theater lyricist/composers Stephen Sondheim to be presented on the Guthrie Theater main stage. "The Guthrie has assembled a sparkling cast and created a gorgeous design that brings this work of art about art itself to brilliant life." "Everything about this show is complicated, and beautiful." "This unique show will give you a lot to contemplate in addition to some gorgeous staging to enjoy along the way." "Sunday in the Park with George is a beautifully painted production of Sondheim's beloved masterpiece"